A delightful story about a happy boy named Asher who goes on a mission to find something which will remind people that Christmas is about Jesus. Written for children, adults may gather something to ponder upon. Additionally, the first Christmas story from the Bible (KJV) is reproduced in the back of the book for those interested in it. You can read a few pages for free. You can buy the eBook. You can buy the Printed Book. "I read this book to my son and then had to read it again because he liked it so much. The real reason for the season seems to be fading from society nowadays. Thank you Mr. Sutherland for keeping Christ in Christmas and sharing your cute story with our children." "What a sweet little story! Mr. Sutherland took the origin of the candy cane (it's more than "just a nice smelling barber's pole") and turned it into an entertaining tale to explain the real meaning of Christmas, which is so often lost to commercialization. It's perfectly written for oral storytelling and is just the right length to hold a little one's attention. Great for the kids...as well as the little kid in all of us." 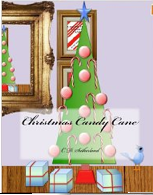 "I enjoyed reading of the deeper meaning of the candy cane and of the true history of Christmas. I had heard of some of the symbology before, but there were several elements that were new to me (for instance, the reason for the peppermint flavoring). This book is written at a level that can be enjoyed by children as well as adults, and all just in time for Christmas."